Like most of my peers, I started out in graduate school as a research assistant, collecting data under less than ideal circumstances. There are all sorts of reasons why the answers you get don’t connect too tightly to reality. People lie. They misunderstand your questions. You and your research are supremely unimportant to them so they just dash off the first thing that comes to mind. Data are entered incorrectly. 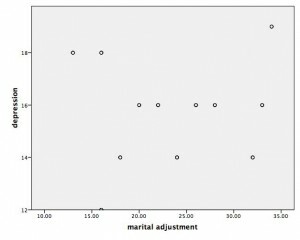 Data aren’t collected at all on some variables, and the values that those respondents ‘would have given’ are estimated. It is a long and rather daunting list. When it comes to human behavior, there is a very imperfect relationship between the measurements we take and the actual concept of interest. For example, gaining or losing weight may be a sign of depression in some people but it might also just be a sign of having been invited to a lot of good Christmas parties or having joined a gym. Three points have popped up over and over in my decades of experience. 1. The simpler mistakes are often the ones that make the huge differences in prediction, for better or worse. 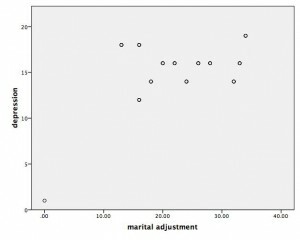 This became apparent to me early on when I found a significant correlation between marital adjustment and depression. The correlation between these two variables was .37, highly significant and certainly worthy of publication. One could certainly find plenty of literature to document why there should be a correlation between how happy one was with one’s marriage and depression. Being fortunate enough to have excellent statistics professors, I did the intelligent thing before publication and really analyzed the data. I looked at the distribution of each variable, the variance and noted that there was one noticeable outlier on each variable. Being the careful type, I deleted this outlier and the resulting correlation dropped from .37 to a very unimpressive and non-significant .07. Once the outlier was dropped, it was pretty easy to see the lack of relationship. This major improvement didn’t come about from a more sophisticated model, from using structural equation modeling to create a composite endogenous variable. It came from doing a simple model correctly. 2. The usual effect is very small. I am often surprised when working with graduate students by their disappointed reaction to multiple correlations of .20 – .50 . I wonder what they were expecting. I explain to them my view that human behavior, and the world in general, is extremely complex. Being able to explain 25% of the variance in anything by two or three variables is amazing and probably has taken advantage of chance to some extent. It is unlikely that the real correlation is that high. They always look at me as if I am slightly daft since some statistics book they read said that .20 is a low effect size and .50 is only moderate. I ask them how many variables came into play in determining the simple decision to contact a statistical consultant – first they had to be in graduate school, and at the university where I am employed, and that meant getting admitted in the first place which meant having a certain GPA, etc. How much more complex is a decision like marriage, divorce or buying a house. How can they expect to explain 75% of the variance in that? Yet, that is exactly what they hoped for. Everyone wants to predict the next Microsoft, Apple, Google. Ordinary least squares models (regression, ANOVA, t-test) assume a normal distribution which is grossly violated when you have one observation 300 standard deviations from the mean. More than that, though, and this is one of the main points of The Black Swan, we don’t know what variables to include. Those outlier events are not a result of the same variables. And yet, the variables in so many of our models are nothing but the different components that go into an adding machine. Our story continues … when last seen, our data were being multiply imputed while Ronda was downstairs not driving the car through the lobby and not running over the guard at the front desk…. So, let’s look at the reason people would do an imputation, seriously now. It is not to create data so I don’t have ugly looking cells and so I can get higher N’s for the means. No, au contraire ! Generally, it is because you have a number of variables, let’s say four, and you are missing data on some, but not all of the variables, for a number of people. You would like to do, say,a multiple regression. If you are missing 10% of the data for each subject, that is not too terrible, but if each of four different variables is missing 10% you end up losing 40% of your sample. That’s bad. and so on. Then, when the hard-working statistician part resumed control of our shared brain it went, “@!$*)+ ! ” or something like that realizing that now, if I wanted to perform a regression analysis, for example, 40% of my data were missing. In my case, the data are missing completely at random so at least that’s something to be happy about. 1. Code your variables correctly. Now let’s look at our variables. If I use weekday as a variable, that is going to be coded 1 = Sunday through 7 = Saturday. It’s rather unlikely that sales, service or anything else is a linear function with Sunday being the lowest and Saturday being the highest (bar tabs, maybe). We can get to imputing class variables later, but for now let’s just assume we have numeric variables and we are going to do a plain vanilla regression. I am going to create a new variable, weekend (= 1 on the weekends, and 0 other days). If you have a categorical variable, such as department, you can use that using the CLASS statement, unless you are using an ancient version of SAS. (I am using 9.2 & I highly recommend it). However, that does require doing things a little differently. For simplicity sake I am going to use all numeric variables, including one variable dummy-coded as 0,1 . Maybe they do and maybe they don’t. Even if they do, the data may not be coded the way they expect. For example, weekday is not a variable that tells if it was a weekday or not but rather, the day of the week from 1 = Sunday to 7 = Saturday. Have you ever been put on hold for tech support, making reservations or anything else and waited so long that you got disgusted and hung up? Well the service level percentage is 100% – the percentage of people who hung up. I want to predict the service level percentage and I think it is a function of whether it is a weekend or not (fewer people on staff), the average amount of time people spend on each call (which means other callers will have to wait) and the average time someone waits before hanging up . This is simple. Sort your data by _imputation_ (which is the imputation number, a variable created by PROC MI) . Then perform your regression analysis by imputation. Output the parameter estimates and covariance matrix for estimates to a dataset, in my case I called it outhistmi . You can go here and see the model for the complete data for all 1,235 records. The estimates from MIANALYZE are shown here. In all cases, the actual parameter estimates did fall within the 95% confidence intervals. However, because I am not that easily satisfied, I went back and performed the regression with the 767 records that had complete data. It also gave me pretty similar results to the full data, which is what I would expect since in this case the data were missing completely at random (probably not a good representation of real life) as I had deleted these out using a random number function. I am still not wholly convinced of the benefit of multiple imputation versus just going with those that have complete data. I’ll have to think about this some more. In the meantime, I have one daughter telling me that normal people play with guitar hero instead of PROC MIANALYZE and another one saying I am going to be late to hear her play the saxophone in her Christmas concert, so I guess I’ll think about it later. 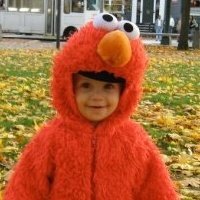 I might still get an answer that makes only a little more sense than , “Elmo!”, say -5 or 146.783 . Well, I really doubt that negative five customers came to the bank that day. What would a negative number of customers, be, anyway, bank robbers who withdrew money they did not put in? The MINIMUM = sets the minimum for all variables to be zero, since we can’t have a negative number of callers and negative time is one of those concepts that was probably covered in philosophy and other types of courses I did my best to weasel out of through one undergraduate and three graduate programs. The ROUND = sets the number of callers to be rounded to 1, the time for speed of answering and length of call and the time people wait before hanging up (less than 11 seconds) to be rounded to .01 and everything else to be rounded to 1. SPSS also offers multiple imputation as part of its missing values add-on. If you have it installed, you select from the Analyze menu Multiple Imputation and then Impute Missing Data Values. At this point a window pops up letting you select the variables and giving you the option to writing the output to a new dataset. You can also click on the Constraints tab at the top and another window pops up which allows you to set constraints such as a minimum, maximum and rounding. Well, how well does multiple imputation do? Here is a really extreme test. I calculated the actual statistics for the month of October and then deleted about half of the month’s data for every group. Okay, well normally you need something more extreme than multiple imputation if half your data are missing, like a new project, but this isn’t terrible. You might notice that the least error is in the last column. Why? Well, it turns out that this is the only department that is open on weekends. The others had data imputed for Saturday and Sunday but were never actually open on those days. Now I am going to go downstairs and hope my daughter has not crashed my car into the lobby and run over the guard at the front desk. Wish me luck.